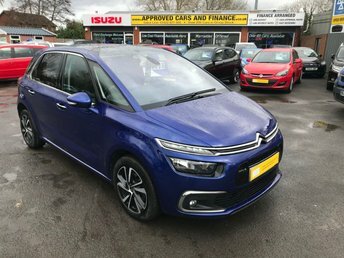 2016 66 CITROEN C4 PICASSO 1.6 BLUEHDI FLAIR S/S EAT6 5 DOOR AUTO 118 BHP IN A STUNNING METALLIC BLUE WITH 50K MILES. 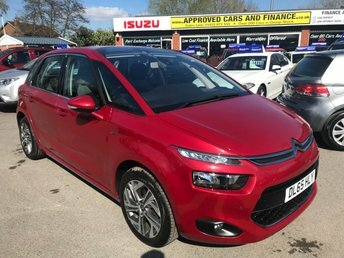 2015 65 CITROEN C4 PICASSO 1.6 E-HDI EXCLUSIVE 5 DOOR 113 BHP IN METALLIC RED WITH 40000 MILES IN IMMACULATE CONDITION. APPROVED CARS AND FINANCE ARE PLEASED TO OFFER OUR CITROEN C4 PICASSO 1.6 E-HDI AIRDREAM EXCLUSIVE ETG6 5 DOORS AUTO 113 BHP IN BLUE. HUGE SPEC INCLUDING ABS,POWER STEERING,ELECTRIC WINDOWS,ALLOYS,METALLIC PAINT,ALARM AND MUCH MORE. OUR VEHICLE HAS ONLY HAD ONE OWNER AND ALSO COMES WITH A FULL SERVICE HISTORY AT 11K,23K,35K AND 47K MILES. PLEASE CALL 01622-871-555 TO BOOK YOUR TEST DRIVE TODAY. 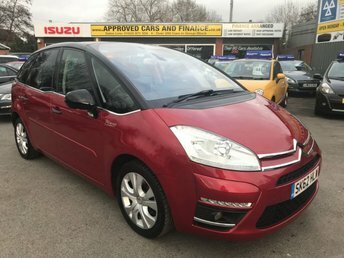 APPROVED CARS ARE PLEASED TO OFFER THIS CITROEN C4 PICASSO 1.6 PLATINUM EGS E-HDI 5 DOOR AUTO 110 BHP 39800 MILES IN METALLIC RED/BLACK IN IMMACULATE CONDITION INSIDE AND OUT WITH A FULL SERVICE HISTORY (BILLS)AND A GREAT SPEC A VERY USUAL MPV BEING AUTOMATIC AND A LOW MILEAGE ONE NOT TO BE MISSED. With five seats, lots of interior storage space, a practical cabin and plenty of equipment included as standard across the range, the Citroen C4 Picasso helps to set the standard in the people carrier class. The diesel variants are the best option for maximum fuel efficiency. Large, panoramic windows mean excellent visibility, while a host of safety features will help to keep you and your passengers safe. 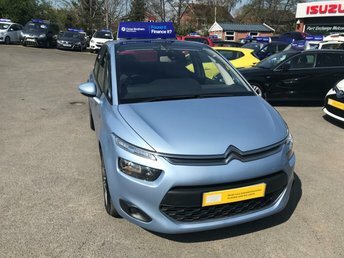 Browse the complete range of used Citroen C4 Picasso models for sale in East Peckham here on our website, and of course you can always pay a visit to Approved Cars Ltd (Approved Cars Izusu) in person to test drive the vehicle of your choice. Contact a member of the team today to find out more.